Most iTunes users know how to create a new playlist: You click the little plus sign at the bottom of the screen or click File, New Playlist. You can also use features like Genius to crank out playlists at will. Of course, this kind of unfettered playlist freedom can lead to what I call Playlist Madness [cue disturbing organ music], which is what happens when your playlist list grows so large as to become unmanageable. 1. Click File, New Playlist Folder. 2. Type a name for your newly created folder ("Alt-Rock Playlists," for example), then hit Enter. 3. Drag any playlist onto the folder and drop it there. Wash, rinse, repeat as needed. Presto! 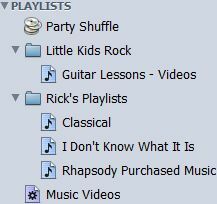 Folder-managed playlists. You can expand or collapse any folder by clicking the little arrow to the left of its name. You can also create subfolders by dragging one folder into another. Definitely a handy way to keep your playlists bouncy and manageable.